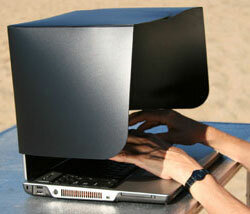 Sure, there are plenty of shades that have been invented for laptops, but this one has a new twist. Comp Shade can be folded up in seconds so you can close the screen of your laptop and it remains attached, ready to shade your screen any time. Great for those Hollywood types doing video editing in the field, it gives you a 9-inch viewing tunnel that makes it easy to see the screen even in the brightest sunlight. It's nice and thin, too, adding just a 3/8-inch thickness to the laptop, still fitting inside its case even with the Comp Shade attached. It's $46.